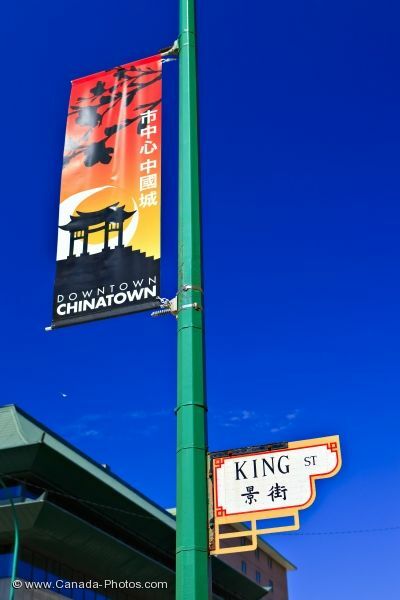 The street sign for King Street and the colorful banner on the post, mark the downtown core of Chinatown in the City of Winnipeg, Manitoba. Formed in 1909, Chinatown is located on King Street between James and Higgins Avenue where approximately 600 people live, 80% being Chinese. Throughout Chinatown, people come to shop for veggies and fruits but many love to relax and enjoy the authentic Chinese restaurants. Dim sum is one of the most popular luncheon meals and many of the businesses in Chinatown have been operating for decades bringing in many return customers. Picture of a street sign and banner in Chinatown in Winnipeg City in Manitoba, Canada. ... Along King Street, there are formal gardens and an ornate gate welcoming many to Chinatown. Banner and street sign on a post in Chinatown, City of Winnipeg, Manitoba, Canada.